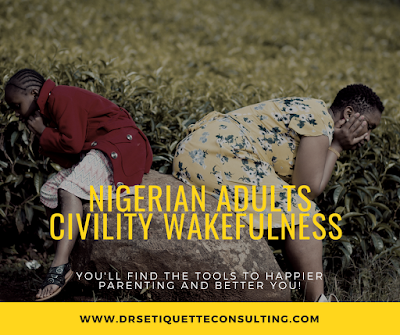 Our everyday experiences today tell us that Nigerian adults are exhibiting less civility toward one another. Unfortunately, children learn by example, they do watch, listen and model what their elders do. I recommend that adults start modeling civility in all areas of their lives if they must send their children off on the lifelong pursuit of their personal best. Few sacrifices are more important in helping our young people increase their own better self, confidence, and sense of self-worth. Our Nigerian Adults Civility Wakefulness Class teachings are so invaluable. This class outlines time-proven guidelines for etiquette and behavior at home; in social settings and offer suggestions on how your children can improve the way they present themselves to elders, at home and in all situations they encounter. Its objective is to aid parents in developing good character by giving them the knowledge of the right way to show respect, thoughtfulness, and kindness in social situations and pass it on to their children. What you will learn will add to your ability to build a cultured home day in and day out. With practice, gradually, it really will become second nature to you. The skills you will learn in our classes will not only benefit you and your children now but throughout their lives. Very simply, what you will learn will give you the tools for happier parenting, better you. And that makes you and what you are about to learn precious! Email at drsetiquetteconsulting@gmail.com or 📱WhatsApp 08170768650 to get started.